Coffee With Games: The Donkey Kong Island Report - Hours of Pain, or Hours of Pleasure? The Donkey Kong Island Report - Hours of Pain, or Hours of Pleasure? First, happy Valentine's Day to all of you! I hope you all had a great day, and perhaps had the chance to spend it with others. 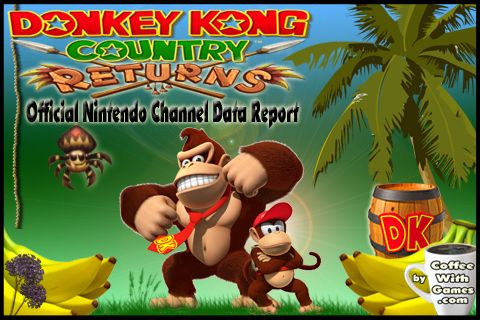 For this report, we're taking another look at Donkey Kong Country Returns! Donkey Kong Country Returns was released 86 days ago, and we last looked at the game-play hours as they were reported on January 17. I'm including a video of my wife and I playing World 1-1, Jungle Hijinxs, with this week's data report, and you can find the game-play video in the "Filtered Thoughts" section down below. 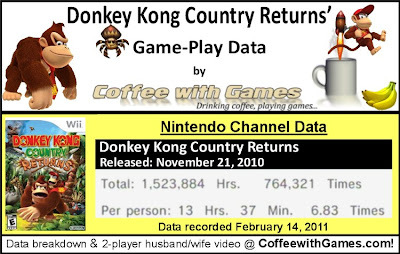 How many hours have Wii owners spent on Donkey Kong Island in the last 29 days, and were those hours of pain, or pleasure? Let's take a look! How many players does Donkey Kong Country Returns have reporting their play-time data? 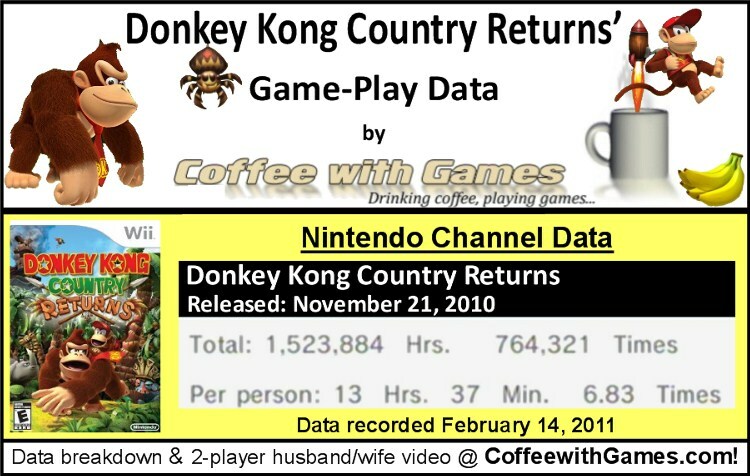 Donkey Kong Country Returns now has 111,906 Wii owners reporting their game-play data through the Wii's Nintendo Channel. Donkey Kong Country Returns has seen an increase of about 34,904 gamers reporting game-play data, since the data reported on January 17. Donkey Kong Country Returns now has 1,523,884 Total Hours of game-play reported, an increase of 693,524 Total Hours of game-play in the last 29 days. The average play-time for DKCR is 13 Hours 37 Minutes "Per person" reporting data, which is an increase of 2 Hours 49 Minutes more than the last average reported. The average play-time per session(or day) reported for Donkey Kong Country Returns is just over 1 Hour 59 Minutes. Donkey Kong Country Returns' Amazon.com sale rank is #43, and it is currently selling for $43.99. Donkey Kong Country Returns' "professional" review score average is 87.69%, based on 48 reviews on GameRankings.com. DKCR has a 4.5 out of 5 Stars rating on Amazon.com, based on 215 customer reviews. Since the last report, Donkey Kong Country Returns has crossed 1,000,000 Total Hours of game-play reported, in 65 days reported. I think it's interesting, though not unexpected, that Donkey Kong Country Returns took 65 days to cross one million Total Hours of game-play reported after it released, while New Super Mario Bros. Wii took just 44 days to cross one million Total Hours reported after it released. As for the play-time with the game in our house, my wife and I have completed Donkey Kong Country Returns 100% (102% now! ), since I did the last report, and we had a blast with the game...even though we aren't "officially" done yet. The video below is of my wife and I playing through World 1-1, Jungle Hijinxs, in Donkey Kong Country Returns. I'm playing as Donkey Kong and she's playing as Diddy Kong in the video. I think DKCR will continue to see a steady increase in game-play hours, but like I stated in the last report, Donkey Kong Country Returns' Amazon.com sale rank is still lower than New Super Mario Bros. Wii and Mario Kart Wii. While DKCR has definitely sold well for Nintendo, I wonder how the game is going to end up with sales in a year's time. While we enjoyed our overall time with DKCR, many of the hours/levels were agonizingly painful (in a video game difficulty sense!)! Being today was Valentine's Day though, if you're looking for a video game to spend time with a "special" someone in your life, I would highly recommend Donkey Kong Country Returns...just beware the game is challenging, but it will give you many hours of pleasure. Have any of you been playing Donkey Kong Country Returns in the last few weeks, and if so, have any of you beaten it? Also, have any of you perhaps played through the entire game co-op with another person, like my wife and I, and found it to be really enjoyable? Or, was your experience more "pain", than "pleasure"? I beat it. Not "finished" yet, though, but I've collected everything and seen all of the levels. I can see myself playing that game for a very long time to come. I actually co-opped some parts with my 2 year old, it made some of the boss battles easier because with Diddy on your back as a second player you can keep keep him longer through damage, as well as respawn him any time. My wife recently started her own save file at my daughter's request to play "monkey game", which surprised me quite a bit. We played the first 3 worlds on her profile so far, she made me play as Diddy because she didn't "need to make it easier." I was also astonished when I let her helm the first minecart level and she cleared it only losing one life. I've seen a lot of whining about those on the internet, so it made me laugh when she said "That was awesome, all of the levels should be like that!" She's not as good at the rocket barrels though, which is cool, because I love those. It is a great game for co-op. You just have to keep in mind the DK version of the NSMBWii bubble, jumping on DK's back. It takes you from two hit boxes to one with higher health, and also gives you the infinite roll. This is a game I've gone a bit back and forth on. We have the original Donkey Kong Country game - though my daughter likes the intro song better than the game itself, because she thought the game was too hard. I'm not really surprised Mario's been outselling Kong so far - in fact a better comparison might be Kirby and Kong? Both are sort of 2nd tier Nintendo platformers compared to Mario. My daughter loves Kirby though, and I think the difficulty I've read about is one of the reasons I have sort of steeered away from the game - not really for myself, but because my son hasn't shown much interest and I'm not sure anyone else would keep up. I am currently up to 7-3 Handy Hazards @ 69%. I've skipped all the 'K' stages till the end when I'll go back to them, but I just passed the 1st one. I do hate the timed high bounce off of enemies. I admit, I have been swearing my head off constantly with this game, but it's so addictive that I can't put it down. Definitely Pain & Pleasure... just the way I like it. I really don't see myself touching 'Time Trials' or 'Mirror Mode' though. After 100% I'm done. There are way too many Wii games I need to catch up on. We are on world 5-4 now but we're being very methodical and getting every letter/puzzle piece/orb before moving on. I enjoy the fact that the game is challenging but not frustratingly so. Looking forward to the rest of it! I did two datas. One by myself and one cooperatively with my older brother. We did not get all of the puzzle pieces as some of them are simply TOO well-hidden. It's definitely a difficult game. I had to beat the final boss with DK alone which was quite the challenge all on its own. Even the rocket barrel levels which I thought I would abhor turned out to be great fun (but still frustrating at times). been wanting to play this one since i first heard about it.. but between udraw , it's games, epic mickey, sonic colors and a few gamecube games in between those, my gaming funds are basically gone.. and i plan on getting a dsi or lite sometime in the next few days. next game we get is a tie between this and mario sports mix. When you said, "I was also astonished when I let her helm the first minecart level and she cleared it only losing one life." Were you talking about your wife, or your daughter? "She's not as good at the rocket barrels though, which is cool, because I love those. It is a great game for co-op." My wife hated the rocket barrels, but we had a typical turn-taking method we would do. If we were just starting, I would start and try to beat the level...if I failed(as I often did), then my wife would take a turn, and we would just keep switching back and forth until we beat the levels. I would say Donkey Kong is above Kirby, just because Donkey Kong has been around longer, and it was also Nintendo's November holiday release...kind of like New Super Mario Bros. Wii was in 2009. As for Kirby and DKCR, DKCR's sale rank is higher by almost 100 spots, last I checked. "I do hate the timed high bounce off of enemies." LOL, that bounce is a make/break in some of the K levels playing co-op...if you're trying to survive with Donkey Kong. As for the "Time Trials", I thought I was going to pass out and need a chiropractic adjustment from shaking the controller so hard trying to beat the time! Kind of interesting you and your wife are on World 5-4...we had recorded footage from World 5, but we decided to just go back and play the first level, so as to avoid showing off the later levels in the game. Yea, my wife and I each have our own separate file, but we haven't gotten very far by ourselves, as we were having so much fun playing together...though I do plan on attempting to complete the game by myself. As for the puzzle pieces, don't forget you can use Squawks and he'll try to alert you when you're near a piece. DKCR is a lot of fun, so if you don't get it anytime in the near future, you can always try to rent it perhaps or just wait until it has a significant drop in price...though with Nintendo titles that may not happen for a while. "and i plan on getting a dsi or lite sometime in the next few days." Interesting, is there a reason you're wanting a DSi or Lite, and not perhaps waiting on the 3DS? I would say if you're getting a DSi or Lite, you may want to wait like 2 months, and just see what the prices do after the 3DS releases if you're trying to save money. Thanks to everybody for the comments and feedback! If any of you want to see a certain level played through co-operatively, leave a comment of which level, and I'll see if Mrs. Coffee and I can play through it and record it. the dsi/lite is for my son.. that's the reason im not getting the 3ds.. he's seven, and after seeing the warnings about it, my wife and i just want to wait a bit. id get one for myself if it wasn't so expensive. plus, since we've started the review blog, i have to worry about getting more games and not hardware. though, i do plan on getting one, but probably not till around the holidays. hopefully there will be a mariokart bundle by then. btw.. me and daemion are gonna be on excitebots most of the day tomorrow.. if you want to have a match or two, send us a message via wii and let us know when you can be on!